The plastic foil has a lightweight French style ambidextrous grip. Size 3 blades only (85cm), weight 100gms. The blade has a tapered section with great flexibility and adequate stiffness. No metal parts inside that could be dangerous. All our plastic blades have been extensively tested for durability. See 'Test Reports' Two tone audible buzzer hidden inside the handle: No trailing wires required. Battery easy to change or remove for 'silent use'. Red and Blue acoustic swords make different sounds for easy identification of hits. 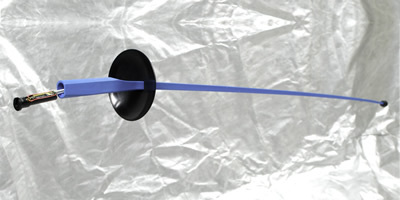 Special rubber tip covering button at point of the blade.